If the internet can be trusted, the history of Korean curry rice goes like this: The British colonized India in 1858, acquired a taste for curry, and developed their own version of the dish that relied on a mild, dumbed-down spice powder. They passed their bastardized curry along to the Japanese towards the end of the 19th century. The Japanese occupied Korea in the early 20th century and passed along the Anglo-Japanese curry tradition to the Koreans. But curry only become popular in Korea with the introduction of Ottogi curry powder in 1969. As far as I can tell, there is no Korean curry without Ottogi curry powder, just as there is no Shake n’ Bake chicken without Shake n’ Bake. This curry powder appears in every Korean curry recipe I’ve seen. It isn’t like the curry powder we buy in a little jar from the Safeway spice rack. Ottogi curry powder comes in a large, shiny envelope and is full of thickeners, sweeteners, oils, spices, salt, and MSG. You stir this into a pan of cooked meat and vegetables, simmer for a few minutes, and voila: thick, glossy, salty, sweet, cloying Korean curry that you serve with white rice. I served it the other night for dinner. Recipe here. It was easy, filling, starchy and satisfying in the way of a casserole made from cream-of-mushroom soup. Unsurprisingly, Mark and Owen liked it a lot. I’m very glad I tried it. Curiosity satisfied. I will never make it again. Twenty years ago, I bought Clifford Wright’s Cucina Paradiso, which contained a recipe for gelo di melone, a dessert that, on paper, blew my mind. Every summer I thought about making gelo di melone but never did, in part because I didn’t want to be disillusioned. I pulled that book out again the other day to see what had so captivated me. 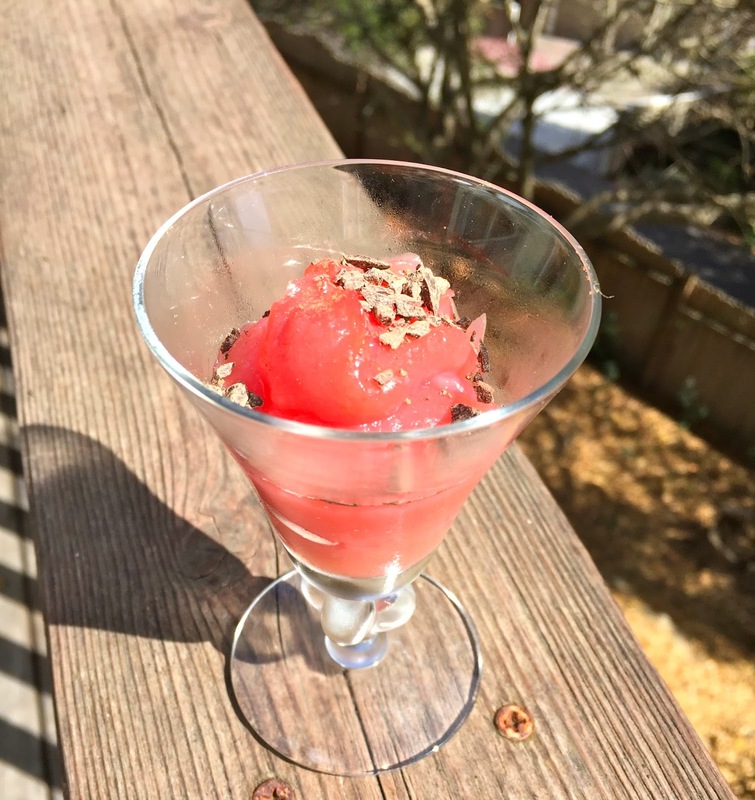 A paperclip was still affixed to the watermelon pudding page and it had rusted onto the paper. If you don’t think that sounds thrilling, there might be something wrong with you. This definitely detracted from the pudding’s charm. But I think the real problem was that cooked watermelon has a faintly vegetal taste. I’m sure that if I were on vacation in Sicily I would fall madly in love with this cool, beautiful, exotic dessert. But in a messy suburban California kitchen when three people were in a hurry to go watch Stranger Things, gelo di melone just didn’t play that well. Both of my dining companions had a bite and pushed away their dishes. One of them promptly opened a beer and the other toasted a PopTart. I ate my whole serving, but really only out of duty. I’m glad I tried it. Curiosity satisfied. I will never make it again. If it sounds like this was a disappointing week in the kitchen, au contraire! Curiosity is a more powerful drive than pleasure. I was very pleased with my cooking experiments. I have some really exciting projects for the coming week. Like this. Last night I went to dinner at the house of friends. They served bibimbap and it was great. Also, SUCH an easy dinner to put together; I am so stealing their idea for my next dinner party. Between that, hearing Robin Ha's comic strip cookbook referenced all over the place, and this, Korean cooking is in the zeitgeist and I must jump on the bandwagon. Not with the curry, though! I know, Korean food is very au courant in the USA right now. I love it. I'm so glad you explained Korean curry in a nutshell! I have been wondering. The Korean/American fusion diner where I work serves curry, and, while some people love it and order it every day, I find it bland and gloppy and never recommend it to customers. 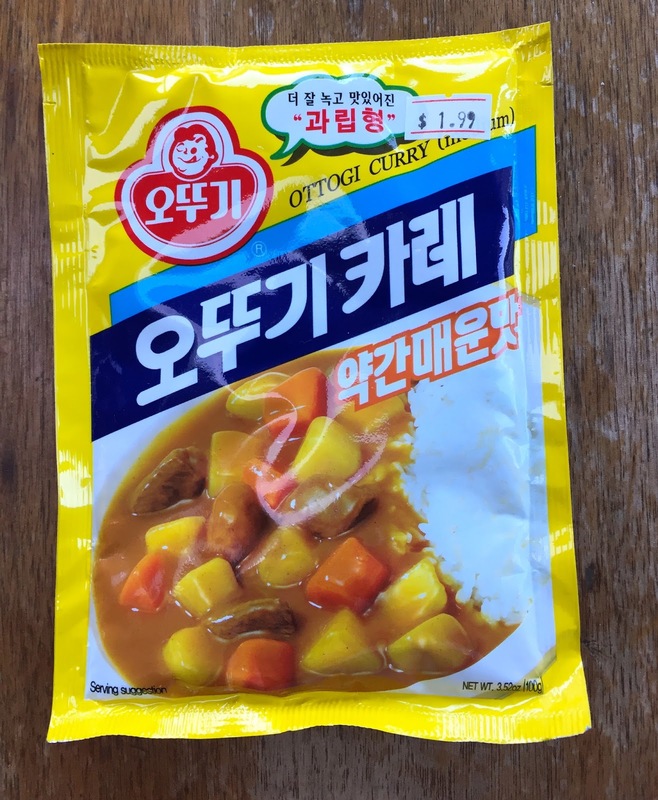 I asked a Korean friend of mine why we had this kind of underwhelming Indian-ish curry at a Korean restaurant and she said it was popular in Korea (the same explanation for why we carried pre-made New England clam chowder for such a long time-- also, apparently, popular in Korea.) But I didn't know the history. I will curious to read about your next project, as I have never heard of a Korean recipe involving cheese! Maybe it's one of those comfort foods you have to grow up with. An American cookbook that reflected how Americans actually eat would probably include Kraft macaroni and cheese -- and I wonder how that would taste to a Korean. You sound as if you are in a very good place these days, Jennifer. I am so glad for you. You are correct, curiosity is a powerful drive, one that keeps our brains active and our wonder alive! Along the journey of curiosity, even a blind squirrel eventually finds an acorn. I must admit, that fiery chicken would probably not be it for me; looks way too spicy for my household. I am enjoying following your Korean cooking adventures. I checked Mixt Salads out of the library the other day, and then promptly came home and looked it up on your blog. I had a vague nagging that you had reviewed it. I was so disappointed it was a dud! Some of those salads looked very good, especially those for fall. Do you have any salad recipes/cookbooks that you highly recommend? I know I should just be creative, but I am looking for some original dressings. It will soon be soup weather, and I am not through with salads yet! I made the extraordinarily simple carrot salad recipe from Simple Suppers, and it was delightful! So true that curiosity is a more powerful drive than pleasure. But maybe that's true only of some of us. Loved that comment. Yes, true for only some of us, in some realms. There are things I'm not curious about at all. Beckster: Jennifer probably has a recommendation. In the meantime you might like to check out Anna Thomas' new book, "Love Soup". She has wonderful flavor ideas for sauces, etc., which could easily be used in making dressings for salads or dips for veggies. I think it's really inspiring, actually exciting. I only read a review of the book, but hope to buy it as soon as possible, budget wise. (Maybe the library is a quicker option for me!). I love salads, and I like to eat one every day. Thanks for mentioning this. I will look it up. I get so many good ideas from the comments. Jennifer, I'm so enjoying your reports on your Korean cooking project. I hope you keep giving us up-dates. Your comment about the packaged sauce reminds me of how my family (Hungarian refugee immigrants to America in 1949), used Lipton chicken noodle mix practically every day MSG and lots of salt included. I loved it! Would make it a an after-school snack. How I grew up to become an organic-only home gardener adult is amazing, considering that Spam too was a pantry staple for my parents. One explanation perhaps, is that we experienced a severe food shortage as refugees in war-time Europe. After that, any edible food seems epicurean! Lipton chicken noodle soup was what my mother fed us when we got sick. The rest of the time she was a health food nut, but then we got sick she'd buy Coke and Lipton chicken noodle soup. So funny. I don't think we ever had Spam, but canned hash turned up every now and then.